Eyes open slightly in the half-darkness. I’m perched on my high cushion like one of the birds. Morning light is coming up. I see them more clearly now. They’re sitting on different parts of the old artist’s easel that I left out there because it’s too big to have inside the apartment. It looks strangely like a work of art, some kind of out-of-context aesthetic event, but can’t think what that might be…. 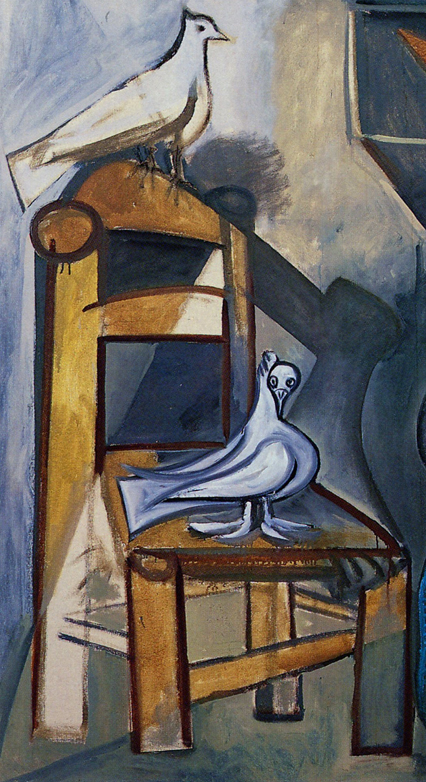 Picasso did some paintings of pigeons and doves that had moved into his studio in the South of France. I look at these pictures and I just know what that must have been like. After a while, in the light of early morning, I notice an odd silence in the bird group out there; no wing-flap. Get up and go over to see. They’re poised on the balcony handrail; all looking out, little necks stretched out and eyes focused on the space outside; the great swimming-pool of sky. Still no movement. Then simultaneously they burst into flight, and gone. As one unit they drop over the balcony and down. A moment later I see them swoop and swirl in a great arc in the sky then on eye level with this 7th floor and in a direct line away from me, they vanish in the distance.